Graphene is one of the emerging materials in the nanotechnology industry due to its potential applications in diverse areas. We report the fabrication of graphene nanosheets by spontaneous electrochemical reaction using solvated ion intercalation into graphite. The current literature focuses on the fabrication of graphene using lithium metal. Our procedure uses sodium metal, which results in a reduction of costs. Using various characterization techniques, we confirmed the fabrication of graphene nanosheets. We obtained an intensity ratio (ID/IG) of 0.32 using Raman spectroscopy, interlayer spacing of 0.39 nm and our XPS results indicate that our fabricated compound is relatively oxidation free. This article is published as Thomas, Deepak-George, Emrah Kavak, Niloofar Hashemi, Reza Montazami, and Nicole Hashemi. 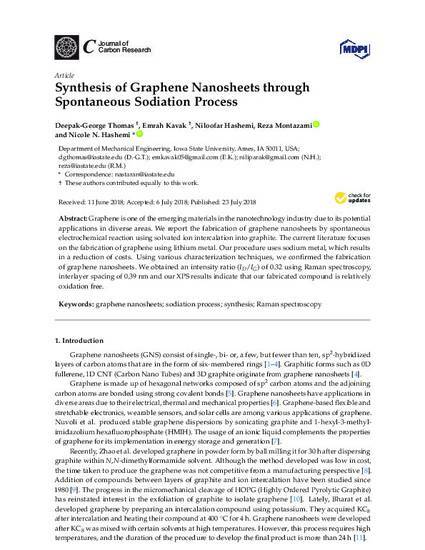 "Synthesis of Graphene Nanosheets through Spontaneous Sodiation Process." C 4, no. 3 (2018): 42. DOI: 10.3390/c4030042. Posted with permission.